Hadassah Hospital in Jerusalem is worldwide known for its extraordinary medical achievements, saving and improving lives of people from all over the world. As I visited the hospital for a minor medical checking, I was impressed by the friendliness of the people and the feeling that I am in the middle of the huge factory of people working without break to save lives. Young girls were distributing for free kosher food to the patients and everyone was friendly and keen to help us to find the right directions. 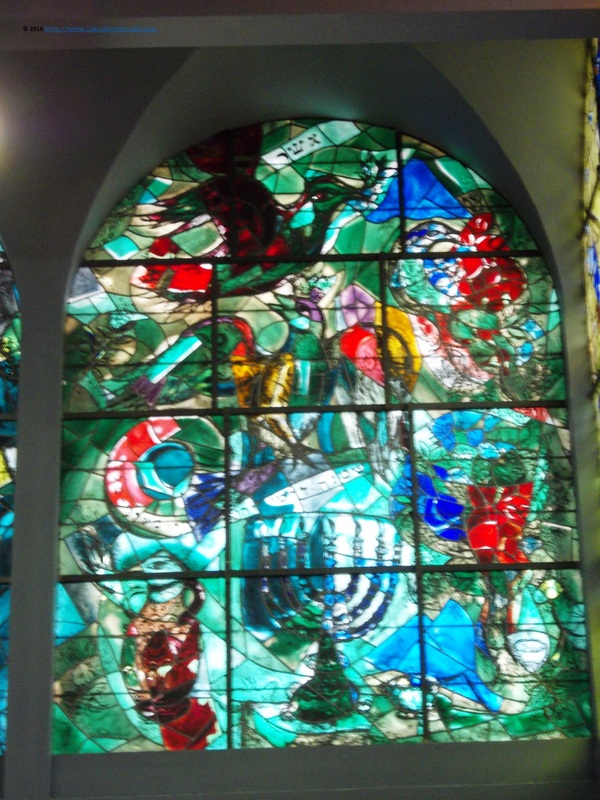 But there is something else that you can find inside the hospital, probably less known for many of the people coming here: the Chagall synagogue. The entrance is made from inside the hospital, at the ground level. After paying a ticket and receiving an audio guide and an explanatory leaflet, you have to slowly close and open your eyes for entering in a different world of colours and lights. 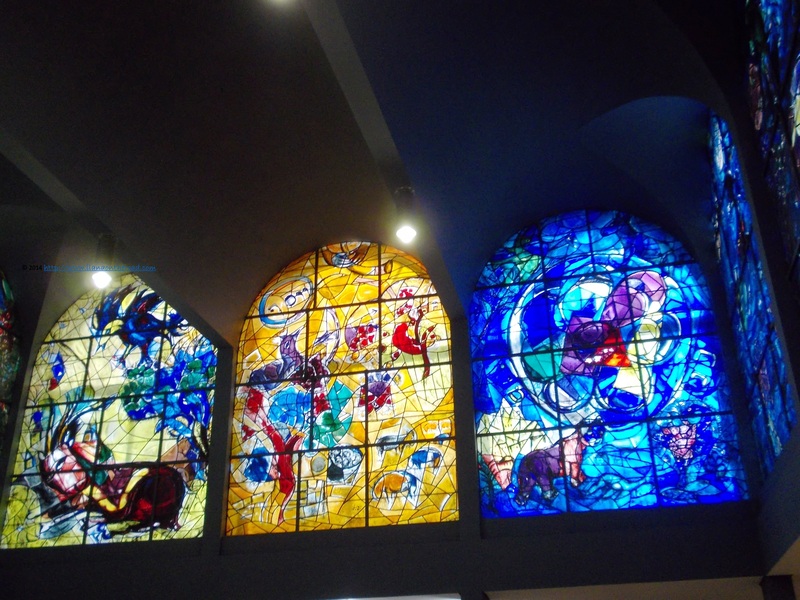 The 3-meter high panels, made of 144 pans of glass represent the 12 tribes of Israel. Every one is a small world in itself of Chagall work. Inspired by the Biblical sources of Jacob's blessings of his 12 sons and of Moses own blessings for the each of the 12 tribes. Each has a dominant colour and is represented by one of the 12 distinctive gems on the breastplate of the Grand Priest and is built around the specific blessing attributed to them. 'All the time I was working, I felt that my father and my mother were looking over my shoulder and behind them were Jews, millions of other vanished Jews of yesterday and a thousand years ago' wrote Chagall after the work - that he considered his gift for the Jewish people - was finished. The works lasted for 2 years and the painter himself took part at the official inauguration. His assistant, Charles Marq developped a special technique allowing the use of more than 3 colours on a single pan rather than the usual procedure of one colour separated by a lead strip. 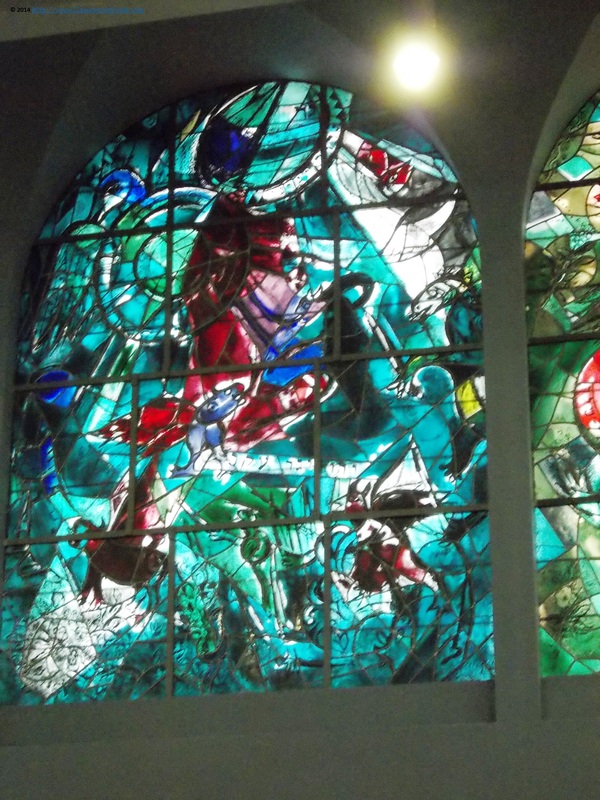 The stained glass was created in Chagall's workshop in France. 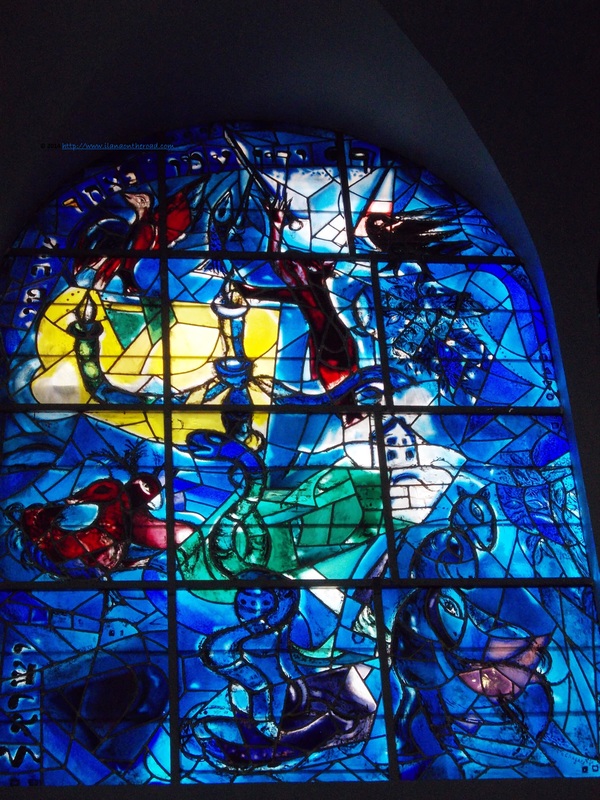 Chagall studied at length the place, trying to find the best way for a proper reflection of the light through the colours inside the synagogue. The rest of the space is simple, with a stone floor which serves to receive the projections of the colours during various times of the day. The decorations of the Aron Kodesh were made by the American-Israeli artist Aviva Green and she finished the work requested by Hadassah together with another Israeli artist, Ruth Hayatt, specialized in textil art. The aim was to offer a simple contrast to the colours of the stained glass, by using simple materials, such as natural fibers and organic contexts. During the Six-Day War in 1967, shrapnels of the Jordanian Army destroyed four of the panels. 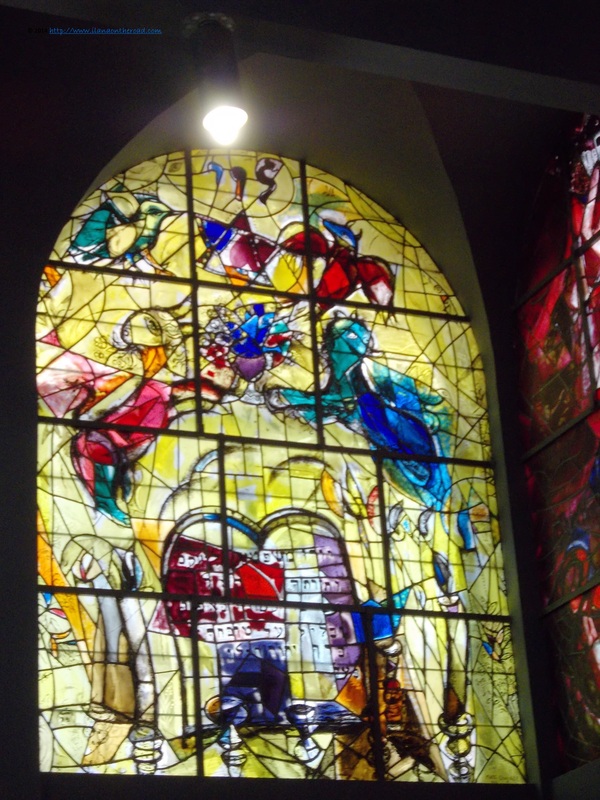 It is said that Chagall, still alive at the time said: 'Don't worry about the windows! Worry about Israel. I'll make new windows!'. 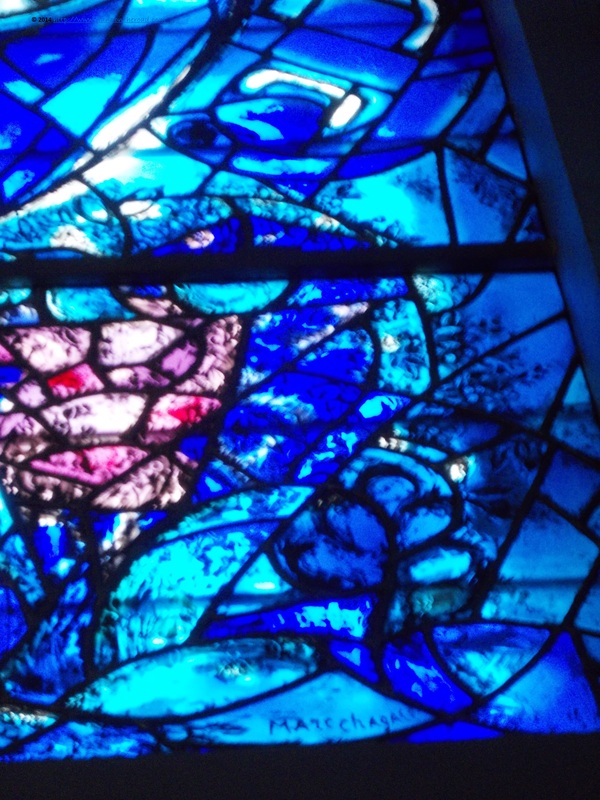 A year after, the damaged glass were replaced under the artist's supervision. Another massive reparations took place at the end of the 1980s that also considered the damage done by the specific Jerusalem climate and the other effects of war, the works being supervised by the son-in-low of Marq, Jacques Simon. The works lasted for one year almost. 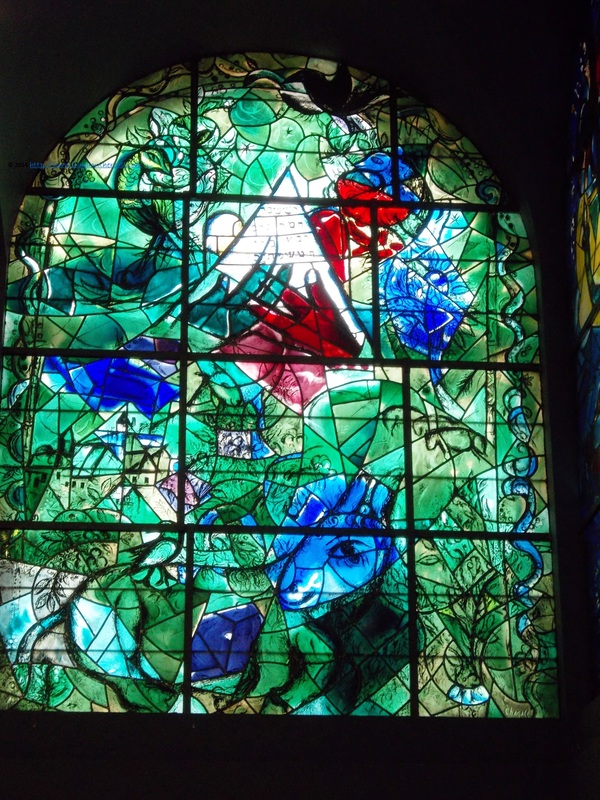 The shtelt of Vitebsk where Chagall grew up is no more here, but his work and modest dedication will keep inspiring us. 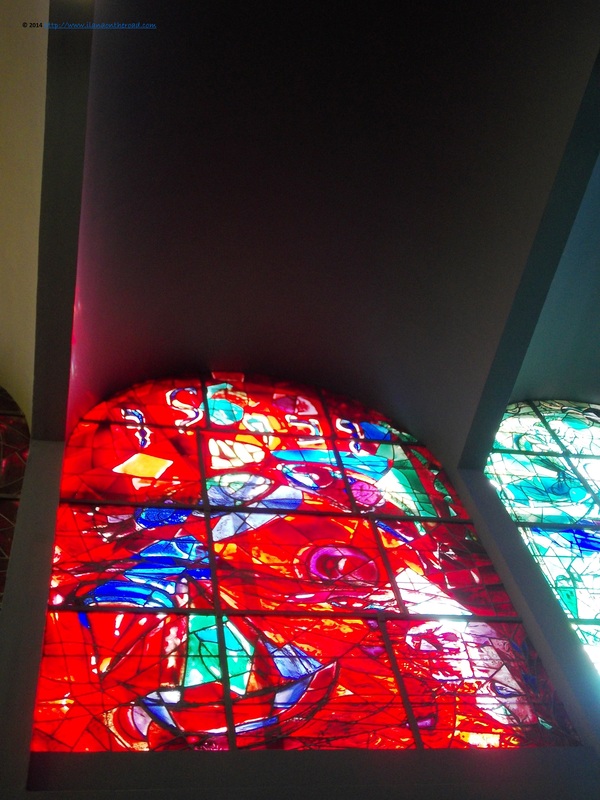 In the middle of a hospital whose achievements can make the world a better place, the delicate stained glass are a testimony of the victory of the spiritual world against all odds and tragedies of the last centuries.